Our annual review of the Federal 2017-18 Budget allows you to quickly see how changes are going to affect you without all the media hype you normally get online. In the below reference guide we’ve pulled out and summarised the changes most relevant to our clients. The Federal Government has managed to meet most expectations and provide very few genuine surprises with this year’s budget. They’re calling it the “fairness, opportunity and security” budget, but like most budgets that have come before it, we’re seeing more tweaks rather than wholesale changes. While we’re not quite sure that the Government really has a plan to help Australians “realise their dreams”, we can see that the Government has finely balanced the needs of profit, welfare and environment with education and security. As is normal in the current environment, there is a projected deficit of $29.4 billion with the expectation of a surplus of $7.4 billion by the 2020-21 financial year. While that sounds positive, keep in mind that the 2014 budget had us returning to surplus by the 2018-19 financial year, so it continues to get pushed out. Of particular interest are forecasts that wage growth is going to pick up from 2% to 3% over the next four years. If this does happen, it’s great news for both wage earners and for the economy in general. It’s important to keep in mind that these are just proposed changes. Given the state of the current Federal Government, it’s highly unlikely to be passed in its current form. Keep coming back for updates as the negotiations start and the chess pieces are moved around. In a move that is sure to delight some families and disappoint others, there have been significant changes to the Child Care Rebate and stricter means testing to the Family Tax Benefit. 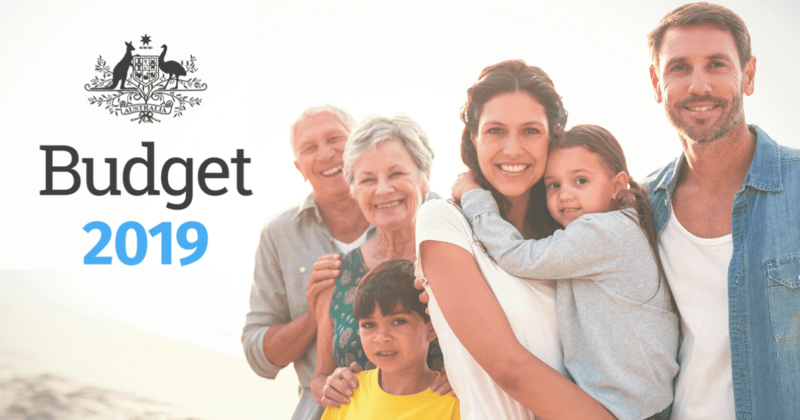 For every dollar a family earns above $94,316, 30 cents will come off the Family Tax Benefit from July 2018. This will affect around 100,000 families. For those that have household incomes of below $185,710, there will no longer be an annual cap for child care payments. Should your family earn more than $185,710 but under $350,000 a year, your cap increases to $10,000. However if your family earns more than $350,000, your child care subsidy will be cut off. From July 1, 2018, $28 per fortnight will be cut from the Family Tax Benefit for families that don’t vaccinate their children. There was a lot of noise about housing affordability being addressed in this budget, however the initiatives are smaller than expected. There was speculation that superannuation was going to be made accessible for first home buyers, however most economists declared this a bad idea. The Government has come up with an alternative which is sure to excite some people. From July 1, 2017, first home owners will be able to contribute up to an additional $30,000 to their superannuation as a pre-tax contribution and then withdraw those funds from 1 July, 2018 to help fund a purchase of a first home. Tightening up of negative gearing laws by disallowing deductions for travel relating to your investment property and denial of some write offs and deductions if the item wasn’t directly paid for by the owner. Foreign property investors that leave their properties vacant and don’t rent them out for at least 6 months of the year will be charged $5,000 per property. To help people sitting on properties which may no longer suit their needs in retirement, those over 65 years will be able to contribute up to $300,000 of the proceeds from the sale of their home to their superannuation fund, provided they have lived there for more than 10 years. This money will also be quarantined from the age and work tests and not count towards the $1.6 million tax free amount. No surprises here, income tax rates are staying the same. With very modest wage growth, bracket creep hasn’t been a material consideration this year. What is changing however, is the Medicare Levy which is set to increase from 2% to 2.5% from July 1, 2019. Last year was a big year for superannuation changes. This year, the Government is leaving superannuation alone. Ultimately, should the economy improve according to the budget forecast, investment savings will increase across the board through a mixture of rising wages and better investment returns. For those that are retired, there are a few small wins this year. Pensioners who lost their concession cards as a result of the decreased thresholds will have their benefits restored. A one off $75 power rebate for singles and $125 for couples. $5.5 billion for home support services. To be eligible for the Aged Pension you’ll be required to have been living in Australia for a continuous period of 15 years. This isn’t a business budget, however small businesses haven’t been forgotten. The instant tax write off for assets up to $20,000 has been maintained and extended for another year. The instant tax write off reverts back to $1,000 from July 1, 2018. The $20,000 instant tax write off has been extended to companies turning over up to $10,000,000 per year. Hiring people on temporary work visas will now cost the employer up to $1,800 per year in additional levies. On July 1, 2017, the five largest banks will be charged a 0.06% levy on inter-bank funding. This is expected to raise $6.2 billion over the next 4 years. Larger fines for banking misconduct of up to $200 million. Free to air and pay TV providers will have license and other fees slashed in order to help them better compete with new online media companies. Further targeting of large multinational companies to pay tax on income earned in Australia which will bring in an additional $4 billion in 2018. A policy that was leaked well before budget night dubbed ‘Gonski 2.0’ provides additional funding for most, but not all schools. University students have not fared quite as well with funding cuts and faster repayment of HECS debt. Increase in school funding of $18.6 billion over 10 years. Application of core concepts of the Gonski education funding plan, which sees more standardised school funding. This will see up to 24 schools lose their funding and up to 300 schools getting less. University funding cuts of $2.8 billion over 4 years. Threshold for HECS repayment to cut in at $42,000, down from $55,000. Those earning over $119,882 will now pay 10% of their income towards their HECS debt, up from 8%. A much better budget for health this year with mainly positives to report. Welfare recipients, however, are going to have a tougher time. An extra $1 billion to gradually unfreeze the Medicare rebate, starting with bulk billing incentives for your local GP starting July 1, 2017. Extra $2.8 billion in hospital funding, with $730 million alone going to Mersey Hospital in Tasmania. Preventable health research to receive an extra $65.9 million. Child cancer research gets a $5.8 million boost. Drug and alcohol testing for unemployed welfare recipients, with penalties and demerit points for missing appointments or not abiding by stricter criteria. Cashless debit cards for welfare recipients who test positive for illicit drugs. This year is a huge year for the Australian Federal Police, with additional funding in order to swell its ranks and provide more internal capabilities. 300 additional staff for the Australian Federal Police. An undisclosed increase in funding for the Australian Security Intelligence Organisation. Defence spending is steady at $34.6 billion next year. The foreign aid budget will be frozen, which will result in the lowest level of aid as a percentage of national income in history. It’s a big year for infrastructure as more money is put into airports, rail and power. In total, the budget has allocated $75 billion over the next 10 years. $5.3 billion in funding to kick off Sydney’s second airport at Badgery’s Creek. The purchase and expansion of the Snowy Hydro Scheme. Inland rail network between Brisbane and Melbourne to receive $8 billion in funding for building a freight network to help farmers and to move goods between the states more efficiently. Further funding for roads and rail across the states. Funding for the South Australian solar thermal plant.